Careful Work: Investigators examine a bench in England for chemical traces of a nerve agent after two victims were found there. Sergei Skripal, a former Russian intelligence officer who became a double agent for the United Kingdom, and his daughter, Yulia, weren’t the only people affected by a nerve-agent attack in Salisbury, England, in March. Nearly 40 others were sickened, including three police officers who were hospitalized, one of them for more than two weeks. 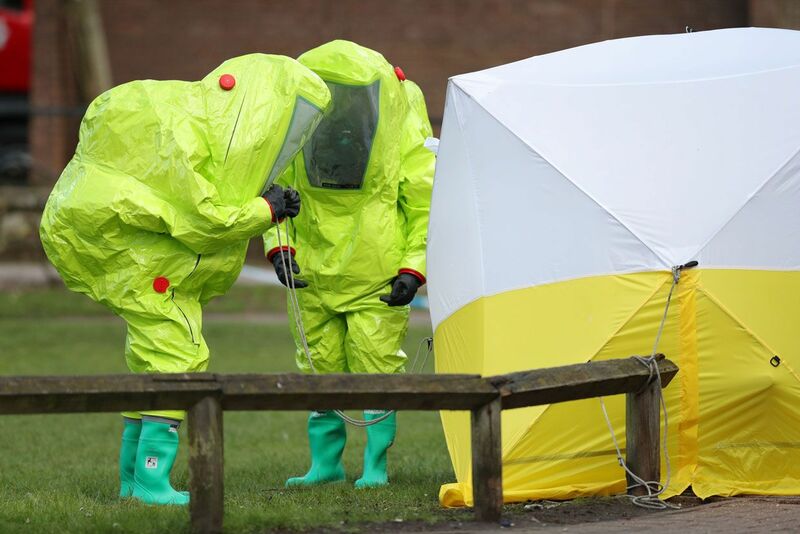 A swarm of hazmat-suited chemical warfare experts inspected every place the Skripals had been recently in the hope of finding out what happened and whether there was still a danger to the public. U.S. intelligence agencies have been on the hunt for a technology that would make such investigations faster and safer and perhaps even prevent this kind of attack altogether. The Standoff ILluminator for Measuring Absorbance and Reflectance Infrared Light Signatures (SILMARILS) program at the Intelligence Advanced Research Projects Activity should conclude, by mid-⁠2021, with a possible solution: a portable scanner that can identify a fingerprint’s worth of a library of some 500 chemicals—spanning the dangerous (the explosive PETN) to the mundane (caffeine)—on surfaces like car doors from a distance of 5 to 30 meters. Program director Kristy DeWitt explains that detecting such chemical signatures is already possible using what’s called Raman spectroscopy. That technology uses a laser, made up of a single wavelength of light, that produces a minuscule fraction of photons of a variety of wavelengths when the beam scatters off the scanned material. What those wavelengths are and what their relative abundance is act as an identifying signature. The problem is that the fraction of new photons is so small that you need a strong—potentially burn-your-eyes-out strong—laser behind it. And that’s no good if you’re planning to surreptitiously scan everyone who walks into an airport. Portable Scanner: This quantum cascade laser built by Block MEMS is one of several approaches to standoff chemical detection being developed for SILMARILS. The systems that SILMARILS is exploring instead use lasers that span a wide swath of the infrared (IR) spectrum and look for spectroscopic signatures in the few photons that reflect back. Using a broad range of IR wavelengths means you can use a less-powerful light source—something no more dangerous than a grocery store scanner, DeWitt says. The three teams in the program are developing a complete system that includes both illumination and spectroscopy, but they each have specialties. Defense contractor Leidos is relying on a pulsed supercontinuum laser. Such devices are typically optical fibers doped with chemicals and with micro- or nanostructures built into them to produce a peculiar nonlinear effect. Specifically, some light pumped into the fiber stimulates the production of a continuous spectrum of wavelengths. Using a series of differently doped fibers, Leidos and researchers at the University of Michigan recently managed to produce a supercontinuum laser with wavelengths that span from 2 micrometers all the way to 11 µm. Block MEMS, based in Marlborough, Mass., is also using a specialized laser, although one that’s less experimental. The company already provides several chemical detection products based on its quantum cascade lasers. These lasers are made of semiconductors with precisely controlled subnanometer thicknesses. Electrons see these layers as if they were a “staircase” of energy and emit a photon at each step. Block MEMS’s twist on this technology is a laser that rapidly sweeps through a range of infrared wavelengths, by adjusting optical components outside of the semiconductor, explains CEO Petros Kotidis. If any of these teams can solve the remaining problems, the applications will extend well beyond intelligence agencies’ needs. “It changes the whole idea of standoff detection,” predicts Block MEMS CEO Kotidis. What Is a Real-Time Review?